I updated the links section on the side. Some of the links to the blogs have been updated and added a few more blogs. Also added a home automation links section. If there’s a link you think I should add please leave a comment. [Update:] Looks like I left off Neatly Sliced. Since that was clearly fault of someone at FTHOI World Headquarters we have made the the first link. Holy crap we got a lot of rain! The state of New Mexico has been pounded with rain for the last 4 days. And I’m talking lots of rain. Despite being in a drought sometimes you can get too much rain. Generally New Mexico gets about 8 inches of rain a year. This last storm brought 2.5 to 3.5 inches depending on where you are. Carlsbad got nearly 6. This is why I suggest a national pipeline. Not to pump oil but to pump water. There would be a network of big pipes located throughout the country. Through these pipes we could pump water from where ever there are rivers and lakes and people living near by. If these waterways flood then we could pump the water to where it’s needed. For example the flooded Pecos river in Carlsbad could have had it’s water pumped to Elephant Butte lake where it’s extremely low. If it floods in the mississippi river valley they and there’s a drought in the southwest the excess water could be pumped where it’s needed. It’s been done with the CAP (Central Arizona Project) where they bring water from the Colorado River to the Phoenix area. I have traveled between Albuquerque and the Phoenix area about 100 times. I have tried every route possible settling on the Albuquerque to Flagstaff via I-40 then Flag to Phx via I-10. This is the fast way taking less then 8 hours (a lot less if your not worried about Cops). I’ve written about the trip before and some of the sites to see. Some of the interesting parts are the modern ruins of Route 66 along I-40. I never knew Route 66 as a road only what I have seen driving along at high speed and can only imagine what it was like when Route 66 was a real road. On down the road in Arizona you will find the Meteor Crater, “50,000 years ago, a huge iron-nickel meteorite, hurtling at about 40,000 miles per hour, struck the rocky plain of Northern Arizona with an explosive force greater than 20 million tons of TNT. The meteorite estimated to have been about 150 feet across and weighing several hundred thousand tons, in less than a few seconds, left a crater 700 feet deep and over 4000 feet across”. You will find a modern vistors center at the crater site itself. What is most interesting is the original visitors outpost located along the old route 66. It amazes me how quickly and easily a building can be come run down so quickly. I can only imagine what a place Two Guns was back in it’s day. The run down buildings once held wild animals one of them still partially stands to say “Mountian Lions”. There’s a standing bridge crossing the Diablo Canyon which was part of the original route 66 road. The whole place is for sale you as of this writing you can drive up on the property. I assume that is so prospective buyers can take a look at the place. Looks like there was once an attempt at a modern gas station but apparently didn’t get enough business. Twin Arrows is another abandon outpost along the old Route 66. Looks a little more modern and from the gas price still partly up on the sign it appears to be opened sometime during the last decade at least. I guess people don’t need to stop as often as they use to for gas thought this station looks a lot more interesting than the run of the mill “modern” stations do. There’s more to Twin Arrows then what you can see from the interstate as the old Route 66 loops back and around this gas station to the Padre Canyon Bridge. 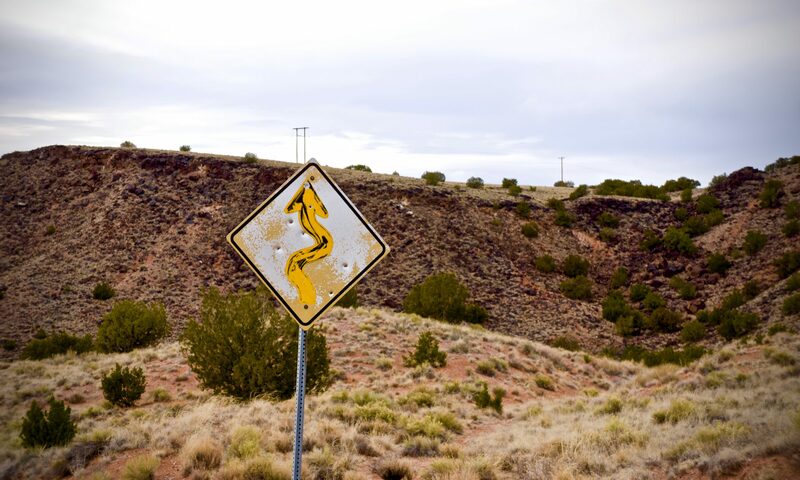 There’s nothing to stop you from driving along these areas of old Route 66.